PC Refresh and Reset has been available since the first release of Windows 8. In my previous post we’ve showed you how to reset your computer to factory default settings, or refresh your installation while keeping your settings and data files intact. One drawback is that you have to reinstall all your desktop applications after performing a PC reset or refresh. If you have installed a lot of applications, or misplace the necessary installation discs or product keys, it can be an annoying and time-consuming task to get your computer back up and running. 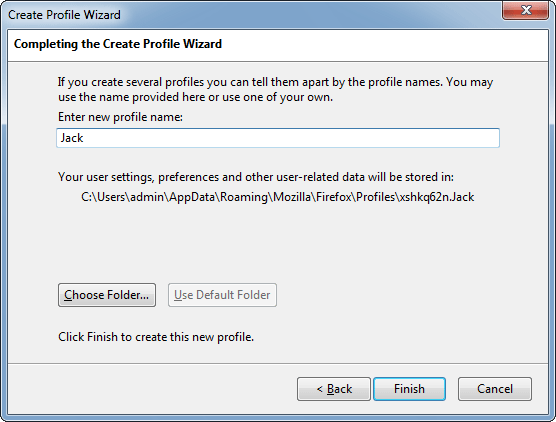 In this tutorial we’ll show you how to use the Windows built-in tool recimg.exe to create a custom image that contains all your desktop applications, so you won’t have to reinstall them after a refresh. A custom image will be a snapshot of the current state of Windows 10 / 8 and that will include all desktop applications that are currently installed on your computer. You should create a custom refresh image immediately after setting up your computer the way you want it so it’s clean and customized. Press the Windows key + X to bring up the Power User menu, and then select Command Prompt (Admin). When the UAC warning appears, click the Yes button. 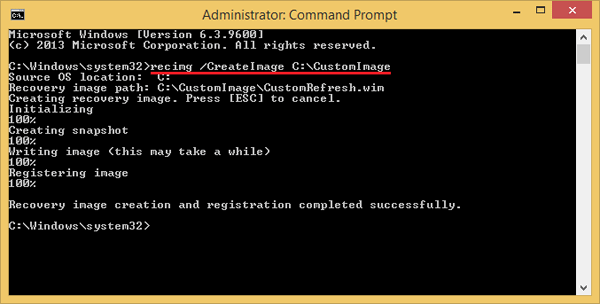 From the command prompt, run the recimg.exe tool to create a custom image file in your specified folder. Enter the above command will create a new custom refresh image under the directory C:\CustomImage. If the folder doesn’t exist, it will create one for you. It could take at least 30 minutes or more to finish creating the image, depending on how many applications you have installed. Once it’s done, you will see a new CustomRefresh.wim file created under your specified folder. And this .wim file will be set as the default refresh image and will be used next time when you use Refresh your PC operation. Note: The recimg.exe tool is not included in the Windows 10 version released on July 29. You can only use it in Windows 10 Insider Builds up to Build 10122 or Windows 8/8.1. From the Windows 10 or 8 login screen, hold down the SHIFT key and click on the Power icon visible on the bottom right of the screen, then click Restart option. In a moment you’ll see the recovery screen. 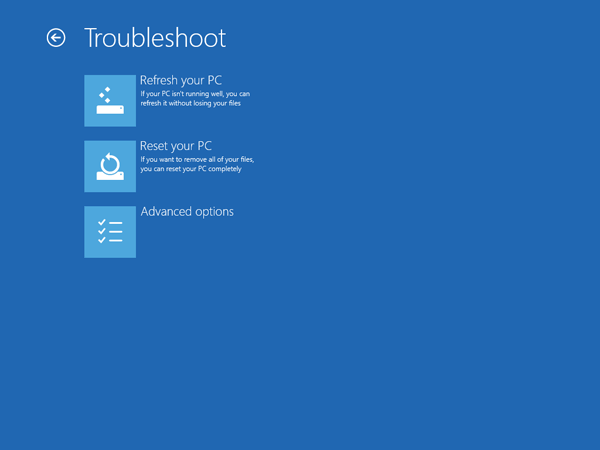 click on the Troubleshoot option. Now click on the Refresh your PC option. Click Next. The system will reboot and begin preparing to refresh your PC. After Refresh your PC, you will notice all your previous installed application are right back to where they were. But you might lose some personal settings from those applications. Last but not least, have a look on your C: drive and you’ll find a new folder named Windows.old, contains all the program files and Windows directory from your previous installation. If any of your applications had additional information stored in their installation directory, you can recover it from this folder. The Windows.old folder could take up a large amount of disk space. Once you’re sure you don’t need anything from it, you can delete it to reclaim free disk space. 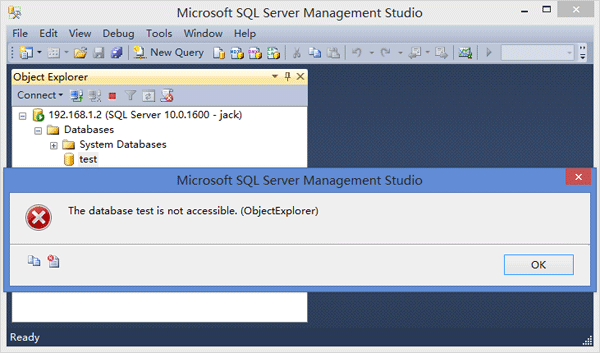 But you might receive the “Access denied” error when you try to delete this folder. 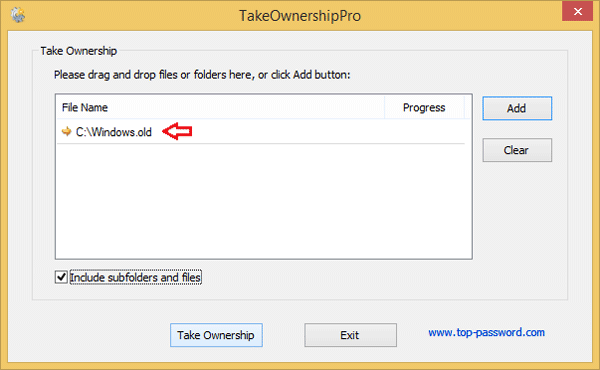 In that case, you need to take ownership of that folder using the freeware TakeOwnershipPro before deleting it. \\Computer_Name is not accessible. You might not have permission to use this network resource. Contact the administrator of this server to find out if you have access permissions. Press the Windows key + R to bring up the Run box, then type regedit and hit Enter. 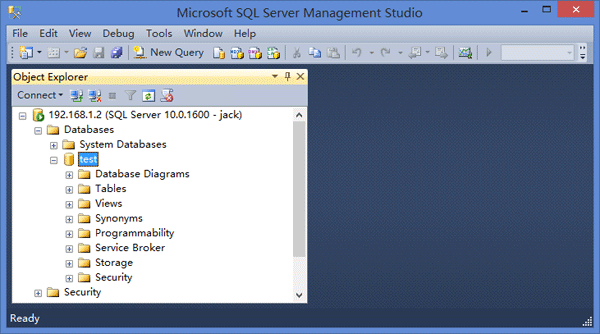 This will open the Registry Editor. 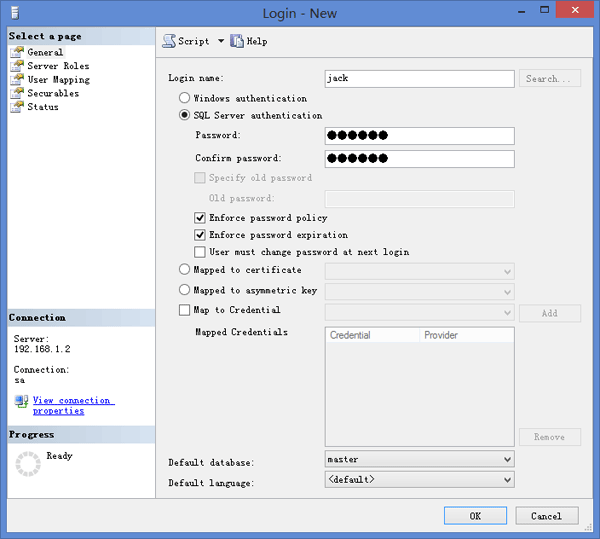 In the right pane of Registry Editor, change the value of requiresecuritysignature to 0, and set enablesecuritysignature to 1. Right-click on empty space and select New and then DWORD (32-bit) value. Name it as AllowInsecureGuestAuth and set its value data to 1. 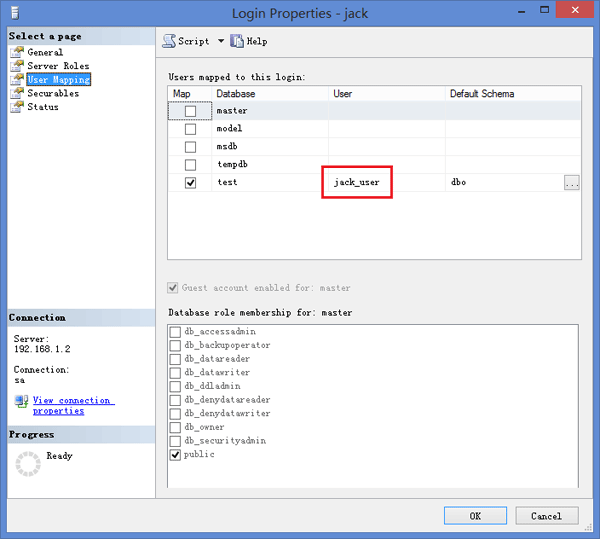 Also change the value of requiresecuritysignature to 0, and set enablesecuritysignature to 1. Close the Registry Editor. Reboot the computer for the change to take effect. After restarting, the problem should be fixed. Whether your system has been running slow or caught a virus, just perform a factory reset and everything will come back to normal. This will completely wipe your hard drive and restore the Windows system back to the state when you first bought it. Most computers don’t come with Windows setup discs any more. Instead PC manufactures create a hidden recovery partition for their PCs. 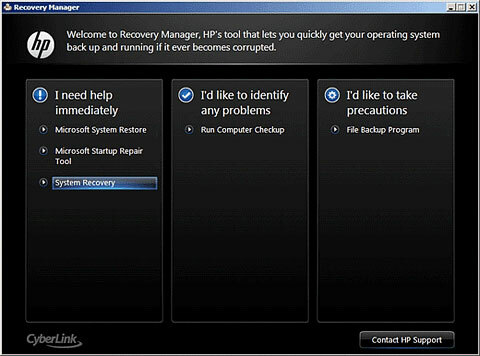 If your computer has a recovery partition, you can run the manufacturer’s recovery tool to restore your PC to factory settings. Here we’ll show you how to restore Dell/HP/Acer/Sony/ASUS/Toshiba/Gateway/Lenovo computers to its original factory shipped state. Note: Factory reset will remove all your programs, files, passwords and other sensitive information. Make sure you back up all your personal files and gather the programs you’d like to reinstall. If you’ve forgotten the saved passwords or misplace your software license key, you can recover them with Password Recovery Bundle. Turn on the computer. When the Dell logo appears on the screen, press F8 several times to open the Advanced Boot Options menu. Depending on your configuration, you may need to select Dell Factory Tools and then Dell Factory Image Restore. 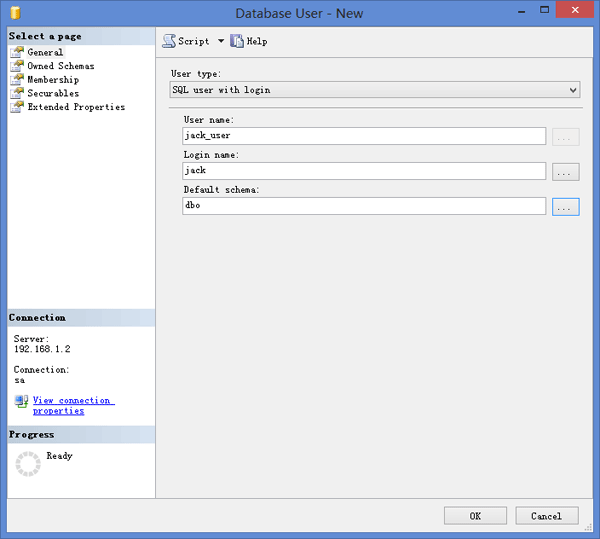 Click Next to open the Confirm Data Deletion menu. Turn on the computer and repeatedly press the F11 key, about once every second, until Recovery Manager opens. 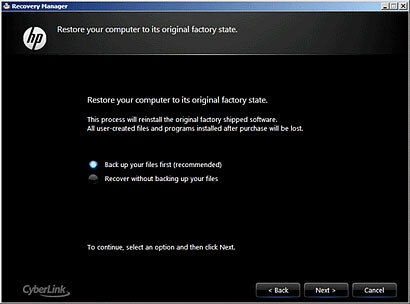 Before restoring the computer to its original factory shipped condition, the program will prompt you to back up your files. Select Recover without backing up your files and click Next if you’ve already backed up personal files. Click OK in the warning that appears. 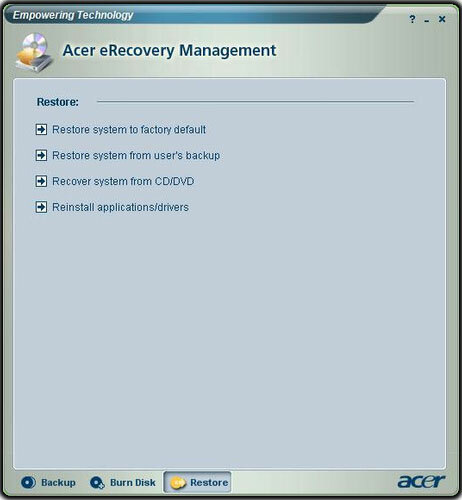 Once your computer turned on, press and hold Alt key, then continuous press F10 button until you see Acer eRecovery System is running. Click Restore Operating System to Factory Defaults. Click Next. Your hard drive’s original, factory-loaded contents will be recovered. The entire system restoration process takes about 40 minutes (may be vary for different computer). Restart the computer and immediately begin tapping the F10 key until the Edit Boot Options screen is displayed. At the Edit Boot Options screen, press the Enter key. Choose Restore C: Drive and click Next. Turn on your computer, and immediately press the F2 key until you reach the BIOS Setup Utility. 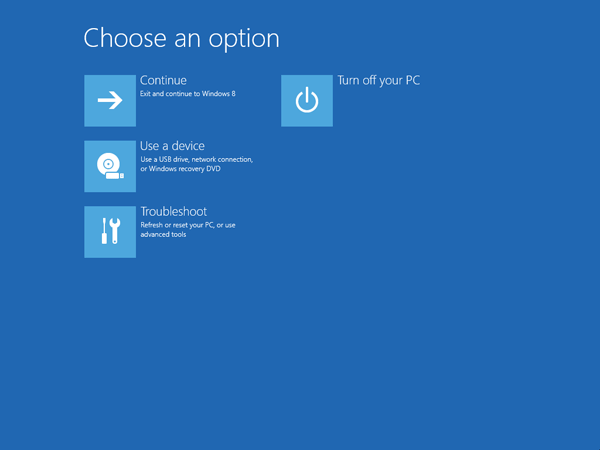 Using the arrow keys, move to the Boot tab, disable the Boot Booster option. Save your changes and exit the BIOS. Restart the computer. Immediately press the F9 key while the computer is booting up. Select “Recover Windows to Entire HD” and press Enter. Press “Y” three times when asked if you are sure that you want to restore. The laptop will restore the factory settings. Press and hold the 0 (zero) key on top of the keyboard (not the zero key on the numeric keypad) and at the same time, press the power button once to switch on your computer. When the Toshiba screen appears; release the 0 key. If prompted select 32bit or 64bit operating system, click Next. When prompted by the warning screen; click Yes to continue with the system recovery. 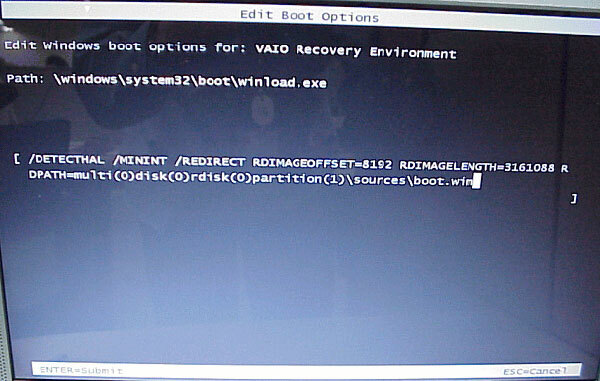 Select Recovery of Factory Default Software, and click Next. Select Recover to out-of-box state, and click Next again. Please read and acknowledge this last warning screen. Click Next to start recovery. Switch on your computer, press the Alt key on your computer keyboard, and then hit the F10 key during the startup process. This will redirect you to the Gateway Recovery Management program. Next up, you need to click on the Restore System From Factory Default option and then choose the Next button to start out the restoration process. Wait for some time until the process is completed. Press on the Novo button at the top of your keyboard, your Lenovo computer should boot up and start the Lenovo OneKey Recovery System. Choose Restore to factory settings from the screen and proceed for the restoration. Most software on Mac OS X is distributed as a DMG image format. The Mac users can open .dmg files on Mac OS X without using third-party software. 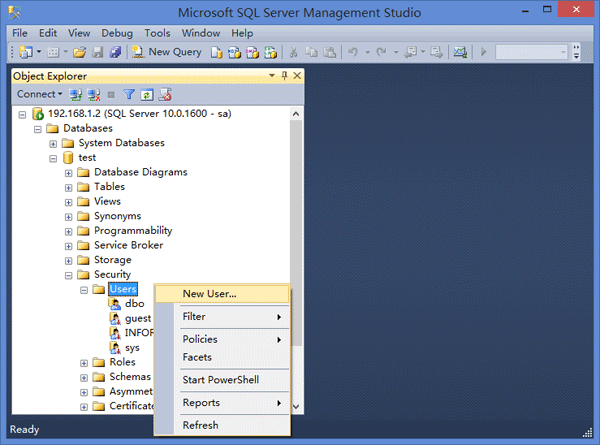 But if you are a Windows user, you will be in trouble, since Windows can not recognize dmg format by default. In this article we’ll show you how to convert DMG files to ISO format in Windows using the freeware dmg2img. How to Convert DMG Image to ISO format in Windows? First head over to this website and grab yourself a copy of dmg2img by clicking on the win32 binary link. Extract the contents of the downloaded dmg2img-1.6.5-win32.zip file to a new folder. Open a Command Prompt and then use the cd command to navigate to the folder where you extracted the dmg2img file. After a few minutes of processing, your DMG will be converted to ISO format. You can then burn the ISO image to your disc or mount it to CD drive for your own purpose in Windows. Since Windows 8, Windows Explorer has been renamed to File Explorer and updated in significant ways. 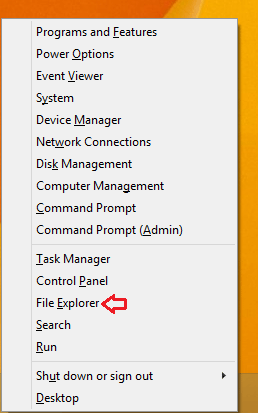 One of the first things I do after installing a new Windows OS is to find the explorer. 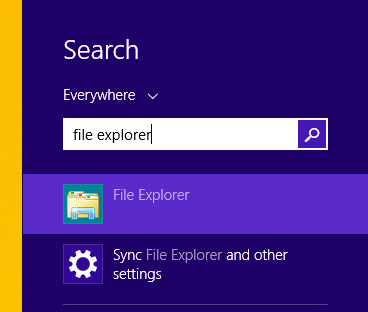 In this article we’ll show you 5 methods to access File Explorer in Windows 8.1 and Windows 10. 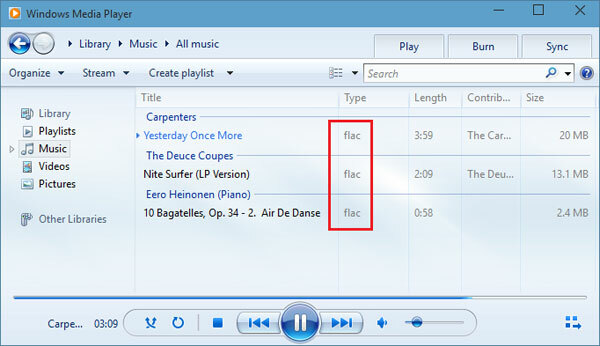 The easiest and quickest way to open File Explorer on all Windows is to press the Windows Key + E combination. Just press Win + E keyboard shortcut and you’ll see the File Explorer open where you can browse through all files on your hard drive. You can bring up the WinX Menu (also known as Power User Menu) with your keyboard by pressing the Windows key and the X key together. This menu contains quick access to system utilities like the File Explorer, Control Panel, Command Prompt, Task Manager, Device Manager, and more. 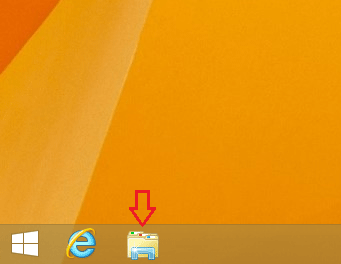 By default, Windows 8.1 includes a File Explorer shortcut pinned to your taskbar. Simply click the shortcut icon on the taskbar and it will launch File Explorer immediately. Swipe in from the right edge of the screen, tap Search (or if you’re using a mouse, point to the upper-right corner of the screen, move the mouse pointer down, and then click Search), enter File Explorer in the search box, and then tap or click File Explorer. 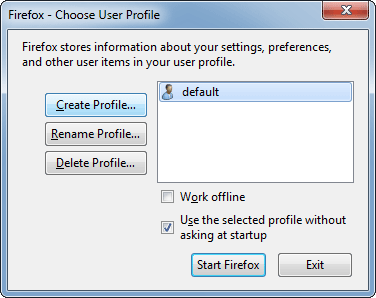 However, most computer users have become accustomed to the way of opening the File Explorer by double-clicking the “My Computer” icon or “This PC” icon on the desktop. 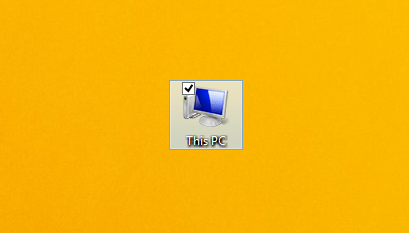 To bring the “My Computer” icon back to your desktop, please refer to this article: Display My Computer Icon on Desktop in Windows 10. 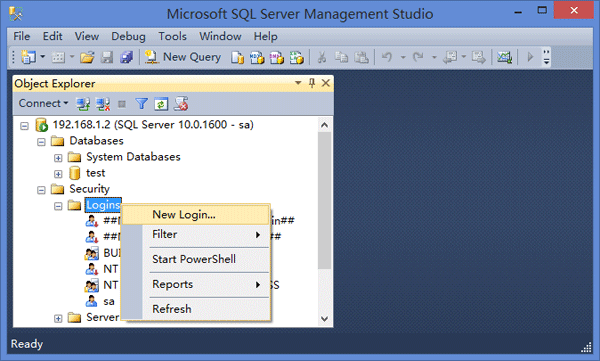 Command Prompt is a built-in tool in Windows that is rarely used by the average user. 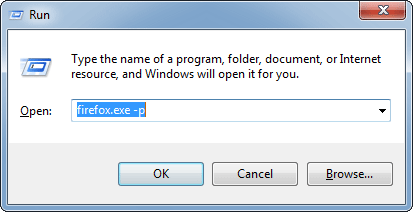 It’s not so user-friendly but advanced computer users with malicious intent can use the Command Prompt to bypass most restrictions that are enforced on the Windows Explorer based GUI. 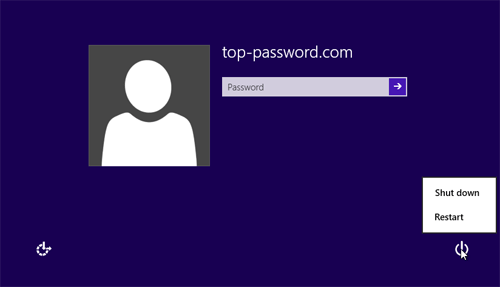 In this post, we will explain how to disable Command Prompt for all Windows accounts. Note: If you need to use the Command Prompt frequently, or run batch scripts or use the Terminal Services, disabling Command Prompt is not recommended. Press the Windows key + R to bring up the Run box, type gpedit.msc and hit Enter. Make sure to click on the System node rather than expanding it. 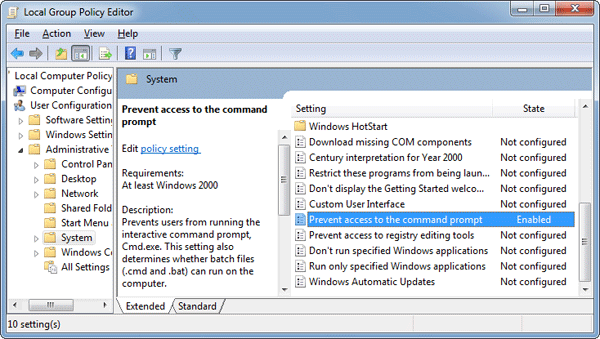 In the right side pane you will see “Prevent access to the command prompt“. 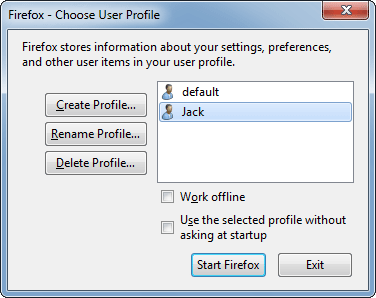 Double-click on the policy and then select Enabled in the pop-up window. Click Apply/OK and you are done. You do not have to restart your computer for the setting to take effect. Press the Windows key + R to bring up the Run box, type regedit and hit Enter. 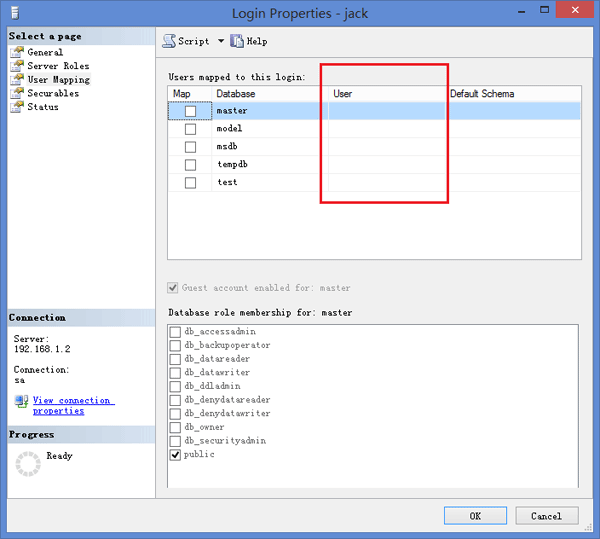 If the Windows or System key is not present, you may be required to create them manually. Right-click on any blank space in right pane, create a new DWORD value, name it DisableCMD and then give it a value 2 you will disable the command prompt. To enable it back, just change the value to 0. So this is how you can disable the Command Prompt in all versions of Windows. 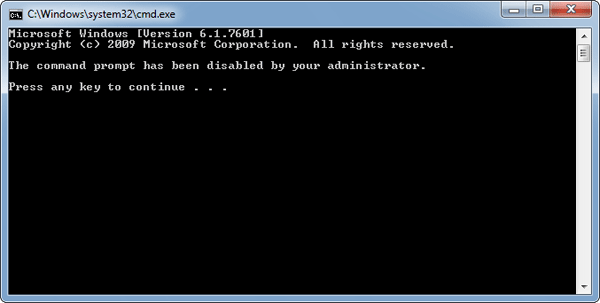 However, re-enabling access to the Command Prompt for all users is as simple as following the steps outlined above. If you need a more secure method to lock the Command Prompt, you can use the third-party software – Protect My Folders, which allows you to protect c:\windows\system32\cmd.exe with a password.